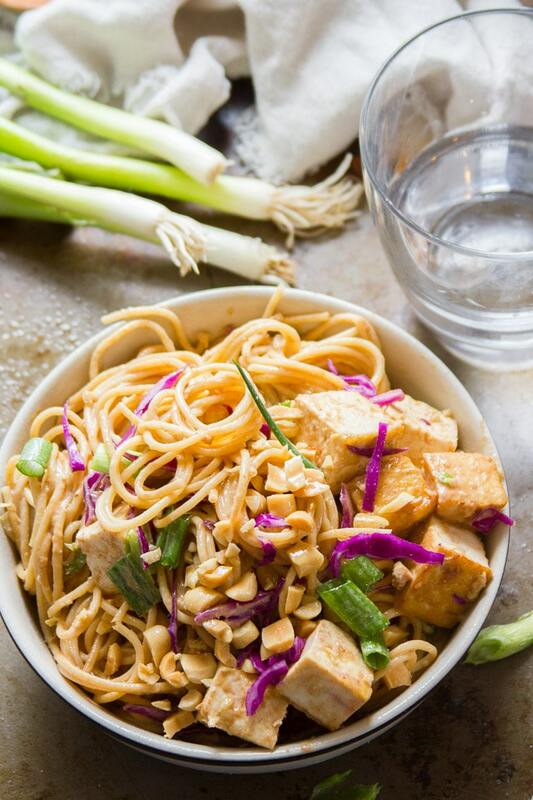 Slurpable noodles are drenched in silky peanut sauce with a touch of sesame oil, then served up with crispy cabbage and pan-fried tofu to make these scrumptious peanut sesame noodles. A delicious vegan meal that can be served hot or cold! We eat a lot of peanut butter in my house. I just counted and we currently have seven(!) jars of peanut butter in the pantry. That seems a little out of hand for a two person house. But I can partly blame this on the fact that my favorite peanut butter (Trader Joe’s!) requires a twenty-minute drive to obtain, so I like to stock up. And my husband has his own favorite brand. And he has a bad habit of buying and opening a brand new jar when he’s still working on the last one, because apparently the peanut butter at the top of a brand new jar is the best. Anyway, it’s no surprise that many of my clean-out-the pantry meals involve peanut butter. And this is one of those meals! We also tend to have a ton of pasta hanging around, and while spaghetti isn’t exactly authentic peanut noodle material, the ingredients are pretty much the same as those you find in lots of fancy Asian noodles. You really can’t tell the difference, so I decided to roll with it! 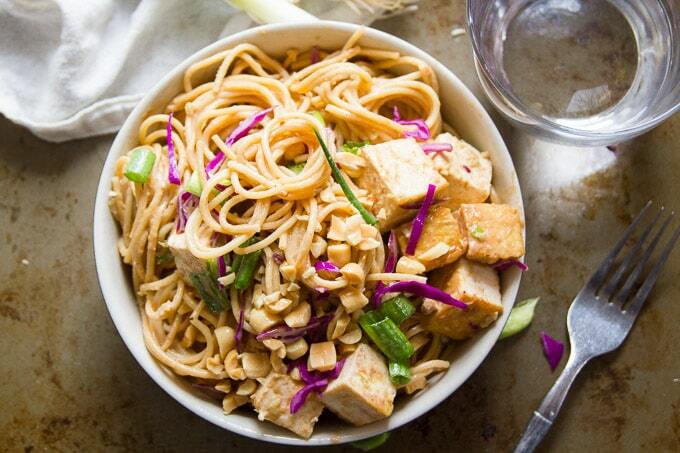 To make this meal you’ll need to start with some peanut sesame sauce. 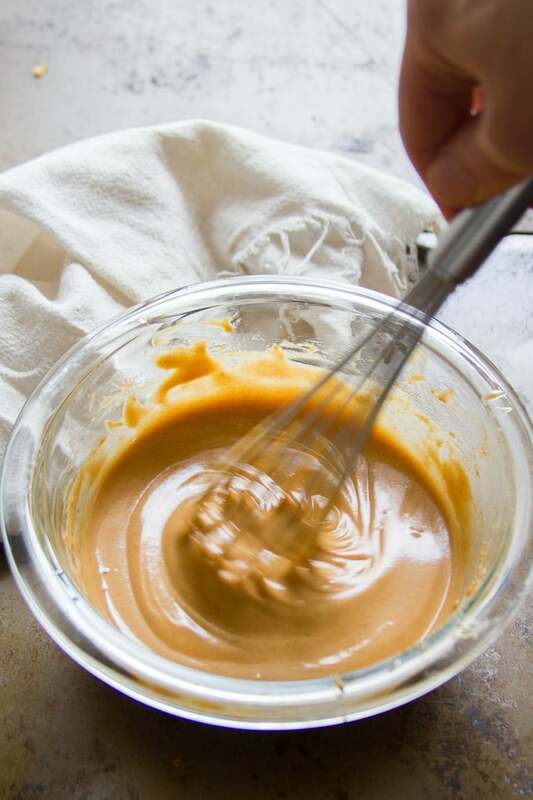 Just like regular peanut sauce, but with a touch of sesame oil. The flavors are amazing together. 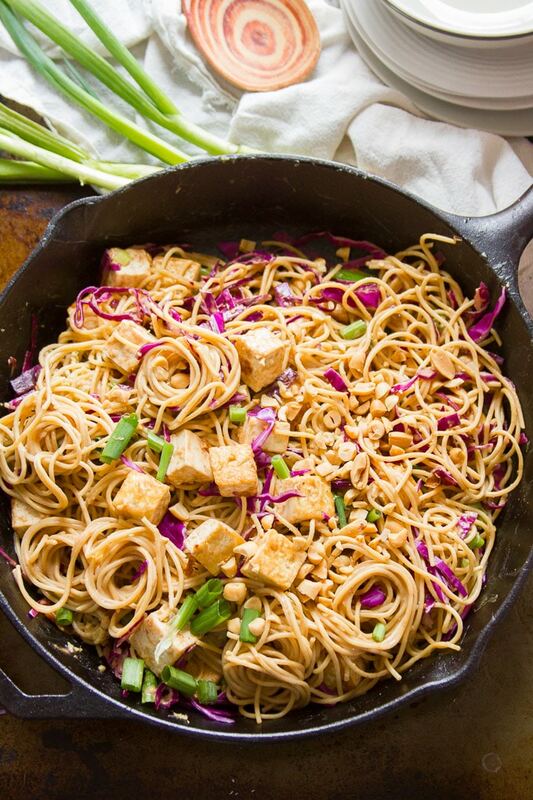 I pan-fried some tofu to go with my peanut sesame noodles, but you can skip that if you prefer. Press it, dice it, and cook it up until it’s crispy. Then shove it to the side of your skillet to make some room for your aromatics. In with the garlic, ginger, and white parts of your scallions. Cook them up very briefly, then add the noodles and sauce. Toss everything a few times and cook it just until it’s hot. Cabbage goes in at the end, so it stays nice and crispy. I normally serve this dish hot, but cold works too! For cold noodles, pan-fry the tofu (or skip it), but then move away from the stove. Instead of cooking the aromatics and heating up the noodles, just toss everything together in a big bowl. If you’re not into the idea of using Italian pasta for this dish, just substitute your favorite Asian noodles. 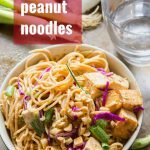 Soba noodles go great with peanut sauce! Feel free to switch up the cabbage with your favorite veggies. While the pasta cooks, whisk the ingredients for the peanut sesame sauce together in a small bowl, thinning the mixture with as much water as you need. You want the sauce to be thick and creamy, but pourable and not too runny. Drain the pasta into a colander and return it to the pot. Toss it with a dash of canola oil. Next, make the pan-fried tofu. Coat the bottom of a large skillet with canola oil and place it over medium heat. When the oil is hot, add the tofu in an even layer. Cook for about 10 minutes, flipping one or two times, until the cubes are browned and crispy on multiple sides. 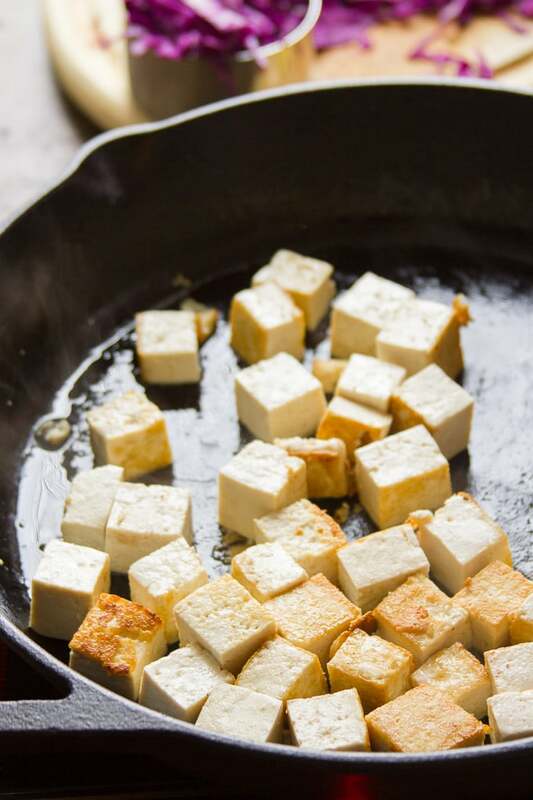 Push the tofu to the sides of the skillet, and add a tablespoon of canola oil to the center, and add the garlic, ginger and white parts of scallions. Sauté for about 1 minute, until very fragrant. Add the noodles and sauce the skillet, and push the tofu back into the center with the rest of the ingredients. 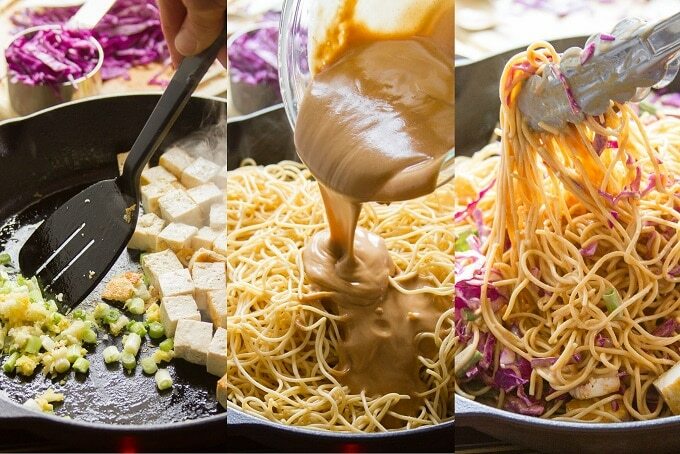 Flip everything a few times to coat the noodles and tofu with the sauce. Raise the heat to high and cook for about a minute, just until everything is heated throughout. Remove the skillet from heat and stir in the cabbage. Top the noodles with the peanuts and green parts of scallions. Divide onto plates and serve. I like to add some coconut milk, hot chili oil, and some dried cilantro and lemongrass to give the sauce a really authentic flavor . I’m so glad you think so! Thanks Morgan! Glad to hear it! Thanks Margarita! !